Humpback whales (Megaptera novaeangliae) fit the word "fascinating" to a T, and their classic breaching display is just one specific example of this. When a humpback whale breaches, he essentially jumps out of the water and whirls around -- often numerous times in a row, but sometimes merely once. 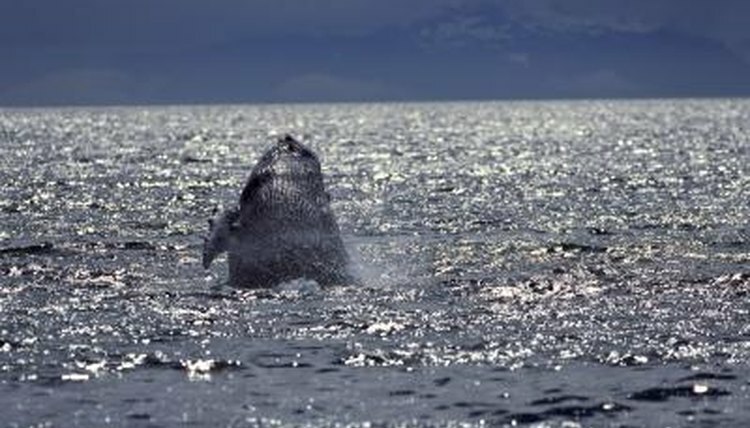 The precise motives behind humpback whale breaching behavior are uncertain, according to the Whale Trust organization. However, a variety of different theories on the action do exist. One such theory is the transmission of messages. A humpback whale might, for example, want to convey to a fellow whale that he's planning on changing his course. He also could be putting on a mating show in an attempt to woo a partner. Jumping out of the water and twirling around might serve as a handy means of communicating either of those intentions. Humpback whales might use breaching communication in times when the environment is perhaps a little too noisy for others to easily make out their singing. Breaching in humpback whales also could be a territorial action, suggests the Petersburg Marine Mammal Center. If a wary humpback whale senses an approaching intrusion or menace, he might attempt to intimidate them away from his personal turf by breaching. These menaces could be anything from gatherings of other animals to ships. Breaching could also be a standard cleanliness routine, nothing more and nothing less. By breaching, a humpback whale could simply be using motion to remove any pesky parasites that could be residing on his body. Jumping around sometimes is enjoyable for humans, and it could also be a form of entertainment for humpback whales. Humpback whales frequently breach by their lonesome, but they also often do so in small units of between two and three individuals total. By breaching, humpback whales might just be reveling in a spirited play session, cetacean style. Breaching could also be a way for humpback whales to cautiously check out their surroundings. If a humpback whale hears a noise that is bothersome or worrying to him, he might just breach as a method of seeing exactly what's on the horizon -- perhaps another irksome ship, for instance. Humpback whales are the superstars of the whale watching world due to their penchants for this intriguing -- and rather puzzling -- display. Apart from breaching, these whales also sometimes hit the top of the water using either their heads, tails or fins. UCSB ScienceLine: Why Do Whales and Other Sea Mammals Breach?